237 Purchases in last 24 hours! Includes vest-front with attached shirt, coat, pants and hat. 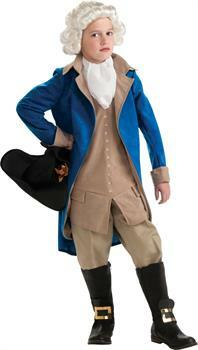 Dress up in style and be the Father of the Nation in George Washington costume this 4 July. This costume is a must have for the Independence Day parade or can even be worn on Halloween or in School Plays.To complete your personality, just add white colored wig and black shoes which are sold separately.